Kelly Kinsley of Murdo, South Dakota displaying his winter’s catch. Photo by Lavonne Kinsley. Furs is one of the oldest forms of clothing known to man, and one of the building blocks of our nation, as the early explorers of this country were trappers. While not as common as 150 years ago when our forefathers relied on it for food, clothing and money, there are still a few men and women around who like to spend their winters outside, trying to outfox animals. In the 1920s Ed Rodewald lived south of the Dismal River in Thomas County, Nebraska, selling furs fed his family and enabled him to build his ranch. He leased the trapping rights to fifteen miles of the Dismal River and trapped, beaver, muskrats, mink and coyotes. 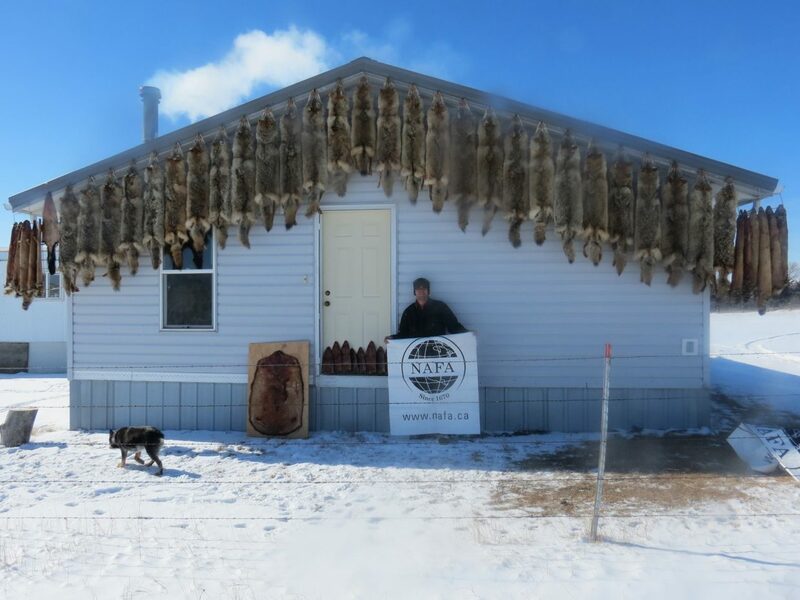 He spent his days checking and setting traps and he and his wife spent the nights skinning. The fur market was high and Ed could sell a muskrat pelt to buy an acre of land and two coyote hides could buy a cow. With his profits from the trap line, he built a large ranch and stocked it with cattle. Times have changed quite a little, with most pelts not bringing enough to make it worthwhile to trap. Flint Licking of Bassett, Nebraska has been trapping for close to two thirds of his life, ever since as a young teenager, he saw the traps hanging on the fence and decided to try his hand at it. He had seen his father trap coyotes on occasion so he knew the basics. After high school he moved to Bassett and had access to better trapping opportunities along the creeks and farm land. He mainly traps coyotes and bobcats since they are the only hides worth anything. A good coyote last season would bring a $100 and big, good colored cats around $400. Licking comes from a long line of trappers; his grandfather trapped for Ed Rodewald and two great uncles during the 1920s and ’30s trapped coyotes all winter and pocket gophers all summer at the Nebraska National Forest at Halsey, Nebraska. "Trapping is labor intensive to do right, but for me it's a fun hobby, as long as you are having fun the work doesn't matter,” Licking said. “I enjoy trapping, it gets me outside and I am able to see things that I wouldn't normally get to see. I like trying to outsmart critters and it's fun to be outsmarted by some of them." "There are a few of us young guys around here trapping; most of the older guys aren't doing it now since most furs aren't worth anything." Licking said. "Around here, landowners are happy to have me catching coyotes, so I have no trouble finding a place to trap." With access to private ground being more limited or reserved for pay-to-hunt partnerships, trapping can be a way to build a relationship with a landowner, and gain access to some beautiful property without infringing on their other hunting pursuits. Many landowners are happy to grant trapping permission to individuals who will be responsible and respectful to the land. Helping to thin the coyote population can be a win-win proposition for everyone involved. Some landowners are even willing to pay by the head for pocket gophers caught, which gives trappers additional opportunities for the nicer times of the year. "It seems that the battle is exposing kids to trapping in the first place,” said Craig Parkhurst, vice-president of the South Dakota Trappers Association. “After that, a good portion of them go on to trap with a little encouragement and support from adults. This is the same thing that is happening to many outdoor and traditional activities. The urban populace loses contact with the land and that way of life. What is needed is exposure to these activities when kids are young." The SDTA is a proud partner and sponsor of the Miss Rodeo South Dakota pageant and together with the Western South Dakota Fur Harvesters Association give each Miss Rodeo South Dakota queen a new fur coat. The Nebraska Fur Harvesters (NFH) offers trapper education classes to the public, with two separate classes being held in September. These classes are get-togethers designed to introduce young people to trapping. They are geared towards youth but can be beneficial to everyone. SDTA has several events each year, an annual membership meeting in April and a two day rendezvous in September, which features a youth trapping seminar, used trap and equipment auction, games, raffles and demonstrations. The full day youth trapping seminar is for kids ages 8-18. This seminar allows kids to learn through hands on trapping demonstrations. They are also taught the proper and ethical way of trapping and have veteran trappers on hand to answer questions. These events are well attended. The 55th Annual Fall Rendezvous will be held September 7th and 8th at the Stanley County Fairgrounds in Ft. Pierre, South Dakota. Information about the SDTA and NFH and their events and classes are available on their websites at http://www.sdtrappersassociation.org or http://www.nebraskafurharvesters.com. "The fur market rises and falls like the stock market. A lot has to do with fashion trends and world economics. The coyote market has been very strong the last 4-5 years due to a company called Canada Goose producing a down-filled parka with coyote trim," said Stane. Petska Fur, based in Ord, Nebraska, travels throughout the middle and western states, buying furs and antlers. They will buy unskinned carcasses but pay more for finished hides. They also will buy outright or will trade deerskin gloves for elk and deer hides. Last season, beaver was worth $8-10, raccoon about $5, muskrats $3, fox $12-22, badgers $10-60, mink $8, coyotes averaged around $50-70 and bobcats averaged around $300. Part of the low market is due to over-production of commercial fur in Europe and a depressed economy in Russia. The high costs of buying traps and the necessary equipment can make it tough for newcomers to start trapping, and the low fur prices are discouraging to veteran and novice trappers alike. In the 1920 and ’30s Ed Rodewald sold his muskrats for $2-3–the same price given today for those hides, yet the trappers costs have gone up considerably. "There are always obstacles to trapping, mostly political,” Stane said. “Some animal rights groups have shut down trapping in a few states. We are lucky in this state that the right to fish, hunt, and trap are in the state constitution so it's harder to politically change the regulations. We have a great furbearer biologist that understands the need for trapping and its benefits."